Marco Werner, Emanuele Pirro and Frank Biela. Pirro and Biela together was almost a ‘given’, after their 2005 success in the ALMS, but despite only one change from the six who raced for Champion at Sebring and Le Mans last year, it’s not quite as simple as a ‘swap’ of Capello for JJ Lehto. In effect, Werner switches cars to the Biela / Pirro machine, McNish switches the other way to the Kristensen car, and the Scot and the Dane are joined by the Italian Capello. “This is the first time I’ll be sharing with Tom," says the Scot McNish. "His pedigree is easy to see through the results and I know he has a similar attitude to racing and winning as myself. After the 2005 Sebring 12 Hours where we fought out the last few hours wheel to wheel and were separated by only six seconds at the chequered flag, we both felt it was easier to race together than against each other - apparently our fathers had already discussed the matter and came to this same decision many races beforehand!" 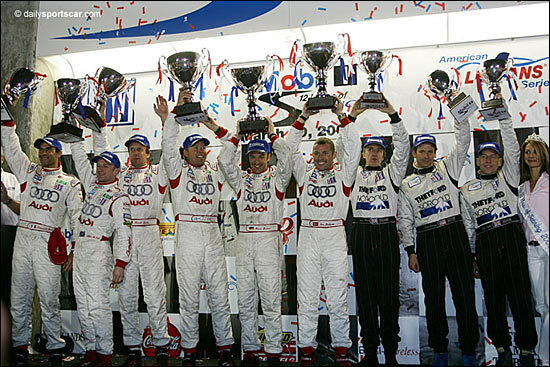 Adding up the Le Mans victories of the two squads, McNish / Kristensen / Capello have ten wins (1-7-2) while Biela / Pirro / Werner have seven (3-3-1). They’ve got 12 Sebring wins between them too. What we can’t yet confirm are the pairings for the two cars for the bulk of the ALMS season - but Pirro / Biela and McNish / Werner seem to be the most likely combinations. This was the scene on the podium at Sebring last year – after an epic McNish / Lehto moment, and then a McNish charge (after Kristensen) at the end. This time they’ll be in the R10s of course.